This movie is a sequel to the mediocre Independence Day, a film that was better than the sum of its parts since it had some heart and patriotism. This one picks up 20 years later after earth has been transformed by alien technology, while we’re preparing and waiting for the aliens’ inevitable return. Unfortunately, this is a lot of awkward jokes and attempts at humor, characters that are mere sketches with obvious stereotypical characteristics (The Jock, The Innocent, The Toughie, The Hero, etc. ), and special effects that are so ambitious they utter fail to be convincing at all. There are still a handful of good moments, a few heroic scenes, and some interesting/cool effects, but overall everything is paint by numbers and the plot is sleep-inspiring in its predictability. Okay action flick about a retired hit man being forced to kill three “impossible” targets. The idea is good, and the action is good, but the manipulations are absurd. For instance, they track down and chase this hitman all over the world, losing dozens of men in the process — if they have the resources to do that, why can’t they kill the targets themselves? Then extort an innocent woman so that the hitman somehow falls in the love with her (after meeting her for two seconds); this hitman is such a softie that when they kidnap the girl, he’s powerful to do anything but obey them. Pretty silly, but still fun, and has a few good moments. A good movie to watch while reading a book. This is a very strange movie with some big stars (like Harrison Ford in a wasted role). It’s filled with clichés and lame stuff transparently stolen from the headlines, such as Steve Jobs-like tech moguls, fake smartphone tech that looks incredibly cheesy and unrealistic, and a plot filled with coincidence and silliness. The basic idea has some merit: a tech wiz is blackmailed to go work for the competition in order to steal tech secrets, thus embroiling him in a complex spy world. But the writers ruin it by doing stupid stuff like having the two companies being run by former partners who now hate each other (gee, that’s original), our hero having previously had a one-night stand with one of his new colleagues, and idiotic spy-within-spy scenarios that are just too convoluted to be interesting. It’s made worse when they can’t get basic reality right, such as how our hero is fired from the first company for being incompetent (he’s worked there for years as a nobody), and yet suddenly he’s like the top guy at the new company. In short, very little of this works. It’s all a muddled mess and there’s next to nothing that relates to the inappropriate title. The top actor names chew scenery with corny dialog and the young ones seem to clueless to realize their in a bad movie. Pretty sad waste of potential. The first and most important thing to note is the weather. Earlier in the week it was 78 degrees and I was sweating. On Saturday a cold front blew in and I actually had snow coming down as I was driving to KC. It was 30 degrees at the stadium that night, which was not good for me as I wasn’t dressed for that, and it wasn’t great for the soccer, which was sluggish and there were no goals. By the end of the night I was a popsicle. Still, it was a fun night. There were fireworks, I got to see how Sporting puts on a match, and I got to explore their stadium. Most interesting to me is the location: basically in the middle of a huge shopping center! There are apparently other stadiums nearby and a race track, so there’s tons of parking (some of a good walk away) and it’s all free. (Compare that to Seattle, where they jack up the parking prices to $40 for a few hours on match days.) Right across from the stadium are huge stores like Best Buy and such, restaurants, and much more. I didn’t have time to explore such things, but had I known I could have come early and done so. The stadium itself felt a little smaller than I expected. Not in terms of seatings (though is a modest 18K or so), but the way it’s designed it’s really just one level. So the loop around the top of the stadium has a few concession stands (nothing that interesting or special) and that’s all there is to it. You descend from that into the bowl where the seats are located. It’s very nice, but I think stadiums like the one in Vancouver, B.C. have more variety. Even Providence Park, in Portland, has different types of architecture and levels. Overall it was fun. I may come back when the Timbers play there sometime, though I’ll definitely not coming the winter (though summers there can be sweltering, so I’d have the opposite problem). Shockingly good character-driven film that’s not all about special effects and mutant powers. Set in the future, it deals with the end of the X-Men, after mutants are essentially cured. But there’s one new mutant, a little girl, that’s being hunted, and that gets Logan (Wolverine) and a half-drugged Professor X to try and protect her. There’s good action and a lot of unusual scenes, like Logan getting old. The movie feels small, in a way, intimate, and that makes it much more powerful. By far the best of all the X-Men movies. I assumed at first that this was little more than a ploy to get more money out of Harry Potter fans, but it’s not: it’s a real movie with great new characters and an excellent story. It’s set about 70 years before Harry Potter, in 1924 New York City where Brit Newt Scalamander arrives and runs into trouble. He’s a sort of zoo-keeper animal behavioralist for magical creatures. There’s fun stuff when some of his strange beasts escape, but a darker plot when he runs into a threat to NYC that could reveal the magical community to the general “no magic” public. Like Harry Potter, there are serious things behind the fun, with real deaths and threats of death, and some people might not like that for young kids (though I think it’s fine and better than the saccharine-coated world most modern children’s literature gives us). The casting and acting is superb (though two characters looked so much alike I got them confused at first); Eddie Redmayne is perfect as Newt. This is supposed to the first of a whole series of “Fantastic Beasts” movies. I can’t wait! Yesterday I had to say good-bye to a close friend of over 17 years. It had been coming. Mayhem used to be a big fat cat of 15 pounds, but the last few years he hasn’t been eating much no matter what I did. 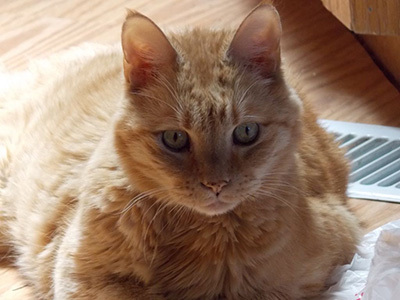 Various tricks worked for a time — feeding him multiple times, separating from thief Minx, expensive cat food — but he never did eat enough and has been slowly wasting away. Last spring he was down to 7.3 pounds; yesterday he was 4.9. He stopped eating altogether on Wednesday. The doctor’s diagnosis was the same as for Mischief: kidney failure, anemia, and the body’s organs shutting down. Sad, but I suppose it’s better to die of old age than get eaten by a wolf. I’ve put together a memorial page for Mayhem — be sure to watch the video of him I made when he was a tiny kitten. It blows me away to see how much of his personality, so evident as a baby, was still there at the very end. You can also look at his never-updated personal webpage, created 17 years ago in January 2000 when he moved in with me. But I finally went to see it anyway and it’s surprisingly good. There’s great action, fun characters (I loved the sardonic robot), and a decent plot. It’s not “important” in terms of carrying on the whole Star Wars story, but it’s interesting. I really liked this! I couldn’t tell that much about it from the previews, and that’s because you can’t really explain much without giving away the story. It sounds generic — about people in suspended animation on a huge starship’s 120-year voyage — but the visuals, good acting, and the intriguing psychological complexity of the plot make it worth your time. I woke up this morning to see a flash — as though someone took my picture with a camera flash — while I was putting in my contact. It was weird, but not enough to call my eye doctor. Then I saw a piece of black thread in my right eye. I ran to take out my contact, but then realized the thread was still there: it was a “floater.” I’ve had those since I was five, but never this bad. These were large and there were a lot of them, swimming around in my eye and distracting me terribly. I finally called my eye doctor and he said I needed an immediate checkup; it was very possible I had either had a retinal detachment or I might get one, and that’s a serious eye problem that requires surgery to fix. To make a long story shorter (it was an all-day story), I ended up going to a retina specialist and getting laser surgery on my eye! My retina had torn — just a tiny hole at the back — and that was sealed with a laser. It wasn’t fun. The eye examination was painful, with lots of poking and prodding and terribly bright lights shown right into my dilated pupils, and the green laser pretty much blinded my right eye for a while. But I got through it and now I’m in the recovery phase. I still have the floaters; it sounds like there isn’t much that can be done about those, though hopefully they’ll dissipate in time. Meanwhile my vision is a little worse in my right eye, but it’s hard to tell if it’s just the floaters interfering or if my eye has gotten worse. At least we caught the problem before it got too bad, though. A detachment sounds really serious, while a tear is much easier to fix. Anyway, it’s a good reminder to be alert for eye problems as you get older; even a seemingly minor change like a flash and floaters can signal something traumatic. I’m not sure why this is getting high marks; it felt very ordinary to me. It’s well-done, and there are a lot of good moments, but the story is awkward, a weird buddy movie about an American CIA agent and a Russian KGB agent joining together against their will to track down a bad guy. Part of the problem is the casting, since every actor is cast as from different country then their native one (i.e. the British actor plays an American, the American plays a Russian, etc.). It’s weird and confusing (and I don’t see the point other than the actors showing off). The story is convoluted, as these things usually are, but not especially interesting. There are the expected betrayals and twists you see miles away, and the ending is anticlimactic. None of this is to say the movie isn’t enjoyable. Despite the flaws and unevenness, I had a good time. But I’d only give it a six out of ten. Fun movie. Great special effects, cool action, and good story about a brilliant guy who took a wrong path and is trying to redeem himself. There’s not much depth here — it’s just a popcorn superhero flick — but it’s well-done. There’s a great balance of all the elements: humor, action, plot. I like that the bad guy is kept relatively modest, unlike so many superhero movies where the bad guy is building a death star or something ridiculously over-the-top. There’s still plenty at stake for a satisfying film. Strange film. Remarkable in some ways, and idiotic in others, this seems like a film that should have been more famous. But I’d never even heard of it. Seems like it was a terrible flop despite having known stars like Chris Evans, John Hurt, Ed Harris, Tilda Swinton, and Octavia Spencer. The premise is weird: in a future ice age, everyone on earth is dead, except for a handful of survivors who managed to board a luxury supertrain. The train is on an elaborate track that takes it around the entire planet, through almost every continent, in one year. It’s supposedly completely self-sustaining and will never run out of power (no explanation of how that works), so it makes sense (I guess) that people onboard can survive the frigid cold. On this train a strange class system has developed, with the tail passengers at the low-end, eating refuse, and struggling to survive, while the rich live in the front and live in luxury and eat steak (no idea where the steak comes from). Thus the story of the film is about a rebellion, where the low-class try to fight their way to front of the train. There’s a lot of good here, in terms of heroic characters, dramatic scenes, terrible violence, and over-the-top villains. The film has echoes of Brazil and 1984 and other classics. Visually the film is amazing, with fantastic ice and snow exterior shots, and a wide variety of interesting indoor scenes (different parts of the train). Unfortunately, the plot is so convoluted and there are so many obvious flaws of logic and important details unexplained, that the whole thing feels awkward and incomplete. As one example, there’s a small dramatic moment (slight spoiler here) where our hero discovers the “protein bars” they live on are made from ground-up cockroaches. There’s a giant vat with millions of them being ground up into a gelatin-like paste. The first and obvious thought (besides being disgusted) is where the heck do the cockroaches come from? In a frozen world with almost no living thing, I can believe that cockroaches survived, but how are they harvested? Especially in enough numbers to sustain the lives of hundreds of people on a train? That’s just one flaw; there are probably 50 such plot holes in the film. It’s as though the filmmakers just wanted certain things to happen so they did them that way, regardless of logic or the rules of reality. That makes this film incredibly disappointing. While on the whole I liked it; the great visuals and interesting storyline are quite compelling. However, the film is so stupid in other ways, it’s absolutely baffling. Worth seeing, but with caution: turn off your brain and just enjoy the show. This is the book the Jack Reacher movie was based upon, and after reading this, I understand more why the movie flopped. Tons of tiny things were changed for the movie for no real reason whatsoever, changing a beautifully constructed plot into an amorphousness mess. For example, the heart of the movie revolves around a sniper shooting, seemingly random, by a madman. In the book there’s a ton of psychology around how four men and one woman were shot (a sixth shot missed), while in the movie they showed several women getting shot, I can only think to evoke more viewer sympathy for the victims. Even dumber, the crime in the book is all about how this is an expert sniper as evidenced by him pulling off six shots in something like seven seconds, while the film has the scope darting around potential victims (even following a woman with a baby in a stroller as though she might be murdered) and the whole shooting takes 30 seconds. The reason these changes are significant is that in the book that’s how Jack Reacher figures out what is going on — by understanding the psychology behind the crime and how it doesn’t match up to the patsy they’ve set up for it. All of that is lost in the film, which is turned into more of an action movie instead of a detective story. Lame! The book is so much better because it allows us to see what’s really going on. Take the scene where the pretty girl tries to hit on Reacher as a way to set him up for a beating. In the book the scene is set by showing us how sexily she’s dressed, her blatant flirting, and the dialog between her and Reacher. In the film the girl just shows up across from Reacher’s table in the bar and starts talking — no preamble. The dialog falls flat, the wit completely lost. The resulting setup feels forced and pointless, not a key part of the plot like in the book. I could go on, but you get the idea. It’s an excellent book, with typical Jack Reacher superiority; the movie turns him into an ordinary guy. Read the book and skip the movie. This is a terrific new film from Woody Allen; his best in ages, if not ever. It’s billed as a comedy but it isn’t very funny unless you like dry or wry humor. I’d call it playful. The story’s about a depressed philosophy professor who is sick of a life of abstract talk and no action and finally “commits an existential act” — that’s a fancy way of saying murder. He discovers this changes everything and he’s suddenly a new man, full of life and passion. Of course, then some obstacles come up as nothing’s perfect. The ending is too good to spoil so I’ll just say it’s terrific, full of witty poetic justice. The whole film is wonderfully acted, photographed, and presented, with just the right light-hearted pacing and tone. It is a bit heavy on the dialog and philosophy, so I can see how this wouldn’t appeal to everyone, but if you like films that make you think without being too intellectual, this is right up your alley. Fun action flick that’s great from start to finish. The plot’s ridiculous and makes about as much sense as mud, but the actors are all having so much fun and the action’s so cool that none of that matters. The story’s is little more than something to string together fantastic action set pieces, but that’s okay, as it somehow works. What a fun book! This is a hilarious adventure about a modern computer programmer who’s a bit of a dolt, who manages to find a file that seems to control reality. He realizes that all of reality is a computer simulation and by manipulating items in the file he can change whatever he wants. For instance, simply find the entry that holds the amount of money in his bank account and a few zeros and suddenly he’s rich, tweak the setting for his height and he’s taller, or change his GPS coordinates and he teleports. Pretty cool! Of course, he hasn’t thought any of this through and soon gets in trouble, and to escape he goes back in time (after all, time is just a setting of the computer program) to the days of Merlin and tries to be a wizard. There he discovers his not alone and gets himself in a real pickle, but eventually becomes the hero who saves everyone. Definitely a must-read for those who like humor with their tech or tech with their humor. Interesting book. Supposedly a classic, but left me a little flat. I love the basic idea — our main character’s story is told via flashbacks during his ongoing sessions with an artificial intelligence psychoanalyst — and it’s a good story about exploring space via mysterious spaceships abandoned by unknown aliens eons earlier. The ships are so advanced we don’t even know how they work or how to control where they go, but they’re able to jump through a wormhole across vast amounts of space; the problem is that they’ll often end up in a bad place, or the trip takes longer than estimated and the crew starves to death before they can get back. Either way, it’s risky, so the rewards for successful exploratory missions are huge. Still, it’s an interesting book with some great science fiction ideas, and an unusual presentation. Definitely worth reading. This seemed silly-but-cool, and that’s exactly what I got. The plot is ridiculous — aliens mistake footage of 1980s video games as our reality and attack us via technology that works just like games (except it’s deadly) — and it’s up to a ragtag team of video game nerds from the 80s who have to save the day. It’s fun. The special effects of the attacking video games are totally awesome and impressive: Pac-Man eating the streets of New York, Centipede descending from the heavens in London, Galaga’s patterned spaceships, a life-sized Donkey Kong, and so on, are all terrific. The nostalgia of seeing the classic games of my youth is wonderful and brought back tons of memories. Seeing nerds become the heros over muscled jocks is immensely satisfying. Yes, the whole idea is a joke stretched very thin, and this isn’t a classic film by any means, but it’s shameless in accepting that it’s silly (Kevin James as the president of the United States???) and it’s just mindless fun. I saw negative reviews where people were clearly trying to take this seriously. Get over yourselves. This is just supposed to be funny! The idea’s pretty standard — a billionaire is dying, and learns of a process where your consciousness can be moved into a younger body. He’s told it’s a genetically engineered body, but after he makes the transfer, he learns that’s not the case, of course. He ends up meeting the wife of man whose body he’s using, and complications ensue. The whole film is competently done. There are few surprises, but it’s a pretty good paint-by-numbers canvas. It’s got intrigue, some action, and some good performances. But just nothing… remarkable. The creatives involved seem to think the basic idea of consciousness transfer is radical and interesting enough to hold the film. The real problem is the predictability of the bad guys, though the vagueness of the transfer process — exactly how the rich guy settles up his life and prepares for a new one — isn’t shown enough to be interesting. None of the characters are that interesting either: the rich guy would be utterly boring except that he’s portrayed by the awesome Ben Kingsley (who is excellent but underused), the husband is a generic soldier, the wife just a pretty woman, and their sick little girl is cute. Even the supposed dramatic moments are generic: the rich guy pines for the daughter he ignored while she was growing up, and now she spurns his help in running a tiny non-profit, the antithesis of his capitalistic ways. Despite these flaws it’s still a fun movie: you get exactly what it says on the label (presuming you read the label). Don’t expect more and you’ll be fine with it. This movie is so bad it’s hard to know where to begin. But I might as well start the with wimpy title. Supposedly “John Wick” is a hard-core hired killer for the Russian mob. They say the name in awe as though it’s supposed to induce shivers. Huh? Why wouldn’t he go by some cool killer name like the Barracuda or something? John’s retired, and living a peaceful life with his wife, until she dies of a long illness. We only see her via idyllic flashbacks, making her seem perfect, yet why did she marry a soulless killer like Wick? We get to endure Keanu Reaves pretending (badly) to grieve. She’s made arrangements to have a dog sent to him after her death, a surprise to help keep him from being lonely, so we get to see tough Keanu fake-cry. Then the film really starts to go downhill. While Wick is at a gas station, a dude comments on his classic car and wants to buy it, but Wick isn’t interested in selling. It turns out the kid is the Russian mobster’s idiot son. He apparently doesn’t know who Wick is (odd, since Wick’s supposed to be such a badass), and he and his buddies break into Wick’s house in the middle of the night, beat him up, kill his dog just for fun, and steal his car. Yeah, he’s sure a tough guy allowing that to happen. This starts a bizarre revenge plot. Wick goes after the mobsters, just walking into their den and shooting people. He’s shot up himself in the process, I guess to show vulnerability. The mobster’s dad puts out a $2 million hit on Wick, so next we have contract killers out trying to kill him, too (and nearly succeeding, as once again, Wick doesn’t seem very skilled). The whole movie is bizarre, with everyone speaking reverently of Wick and his nearly superhuman killing abilities, and yet Wick nearly dies like 10 times. He’s actually caught and captured by the bad guys, doesn’t even count his shots so he ends up running out of bullets multiple times and pulling the trigger on empty chambers, and several times requires the aid of friends to save his hide. Then the climax is him and the mobster dad duking it out in a gunless punch fight! In the end, this is a Game of Thrones-like death feast, with pretty much everyone dying, and no point to anything. The film has a few interesting moments and concepts, like the strange “hit man” hotel, where hit men are promised security while they stay (and yet the windows aren’t even bullet-proof), but mostly is tedious with laughably implausible scenes and weak action. Shocking they got the quality cast (Keanu aside) to participate. This an interesting older Herbert book, set during some future war, about a submarine “tugs” that tow undersea barges of oil. The unnamed enemy has been intercepting and sabotaging every oil run, so the authorities think there’s a “sleeper” agent. Our hero’s a psych guy who can supposedly use his skills to ferret out the mole. The story’s about one run, during which everyone is paranoid and suspicious of everyone else. There are multiple sabotage events, a murder, enemy subs tracking them, and all sorts of life-threatening mechanical problems they have to solve. Unfortunately, it’s more technical than interesting, and the mole aspect is just confusing. It’s hard to keep the various characters straight. The conclusion is unusual, though the sleeper agent aspect is a letdown. All-in-all, it’s easy to see why this is a forgettable Herbert novel.